Body sugaring is an art form that can be taught to anyone who has a desire to learn, but it can only be perfected by those who are willing to practice. Known as “halawa,” meaning sweet in Arabic, sugaring is the ancient art of hair removal that has been practiced by Middle Eastern women for centuries and is still practiced today. Body sugaring dates back to the ancient Egyptians who considered a hairless body to be the standard of beauty. It was customary for women to have all of their body hair removed before their wedding night. The method of body sugaring currently used is similar to the ancient art form, but has been modernized to meet the safety and sanitation standards of today’s spas and salons. Although the methods used for sugaring have been modernized, sugaring is definitely still an art. It will take patience and practice to become fluent. For those looking for a way to increase revenue and make their spa business stand out, sugaring is a niche that can set you apart. If you’re already waxing, the transition to sugaring may present some challenges because the techniques used are different. The best time to learn sugaring and obtain certification training is while you are still in esthetics/cosmetology school. This will allow you to perfect your sugaring technique and practice before you transition into a professional position. Before graduating from school, look for other sugaring practitioners who may be willing to partner with you or who may be prepared to hire someone newly certified in body sugaring. They can mentor you as you build clientele. Seasoned professionals who have been waxing their entire career but are thinking about transitioning to sugaring should seek training from a reputable company. There are numerous companies available that offer training, so here are a few things to consider as you seek the best training. Does the company have certified educators who are licensed practitioners offering live, hands-on training in your state or a nearby state? How long has the educator been sugaring, and does he or she practice full-time? Does the company offer products made from high-quality, natural and/or organic components, including a variety of non-crystallizing pastes? Are class sizes limited to no more than six students per educator? Does the educator teach techniques to help you preserve the health of your hands and body? Will you leave the training class with all the tools you need to succeed in your practice? Are advanced and refresher courses available? Will you be provided with ongoing support? Sugaring has many benefits, and some practioners may choose body sugaring as their sole method of hair removal. If you choose to include sugaring as part of your menu with other skin care services, you can typically expect that sugaring will comprise 27%–45% of the revenue for your spa. Whether you decide to sugar exclusively or add it to your current menu of skin care services, the investment is minimal to get started and can be recouped with 10 to 15 Brazilian sugaring services, depending on how you value your time. Costs for training and products will vary depending on the company you select, but the initial investment is relatively low in comparison to the profit you will be able to realize. It is highly recommended that you invest in live training that will offer you plenty of personalized attention and hands-on practice. The chart Sugaring Cost Analysis is an example of the number and types of services you should be able to perform using one 35-oz. tub of sugar paste at a cost of $23. There are different consistencies of paste available from firm to soft, but the choice of your paste will have more to do with the environment of the room in which you are sugaring than the type of hair being sugared. Some wax manufacturers add sugar to their products and call it sugar wax, but genuine sugar paste is a blend of sugar, water and citric acid from lemons. Before sugaring, be sure to consult with your clients and obtain an intake form as you would with any other service. You will also want to provide after-care instructions to ensure your clients know what to expect after treatment. Here are some questions frequently asked by clients. Q: How long will my hair stay gone? A: The normal growth cycle of hair for most people is about three weeks, so you may start to see hair returning at this time. The majority of our clients schedule treatments every four to six weeks. If your desire is for faster refinement, then treatments should be scheduled closer together. Q: Does sugaring hurt like waxing? A: Many of our clients who converted from waxing say that sugaring is less painful. Sugaring is still extraction of hair from the follicle root, so it is not without some sensation. Q: Can sugaring get rid of the peach fuzz on my face? A: Yes, sugaring can safely remove vellus hair from the face. Since the face is a delicate area, perform a patch test first. Facial hair is dense and sits close to nerve endings, so removing it will set off alarms in the nervous system causing a histamine reaction. If a client has had bad experiences that make them hesitant about facial hair removal, have them call you to schedule a consultation. Q: How long does the hair need to be to get sugared? A: Your hair needs to be at least one-eighth of an inch, but no longer than one-quarter of an inch. When sugaring, the hair is removed in its natural direction of growth, so it’s possible to extract hairs as short as one-sixteenth of an inch. There’s no reason to let hair grow long before getting sugared. Longer hair will only cause undue discomfort during the service. If a client is a regular shaver, they will want to stop shaving seven to 10 days prior to their first sugaring appointment. There are many things to love about sugaring, and the one thing you will probably love the most is how easy it is to clean up. All you need is water and wash cloths. If you spill sugar on your table, cart or counters, it wipes right off with a wet cloth. When you are finished sugaring your clients, just take a warm, wet cloth to remove any excess sugar left on the skin. There’s no need for oils or solvents and no worries about damaging or permanently staining equipment, clothing or flooring. Body sugaring will bring you many happy and highly satisfied clients who will keep your appointment books full. You may not master the art form overnight, but stick with it. Seek professional, advanced training with ongoing support to help you become proficient. You’ll soon discover there’s no sweeter choice in hair removal options. Shonda Gonzales is a licensed esthetician and licensed massage therapist. Shonda has been practicing esthetics since 2012 and graduated from Xenon International Academy. 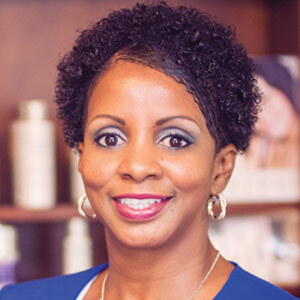 She is the founder of Spatique Wellness, LLC in Overland Park, Kansas.